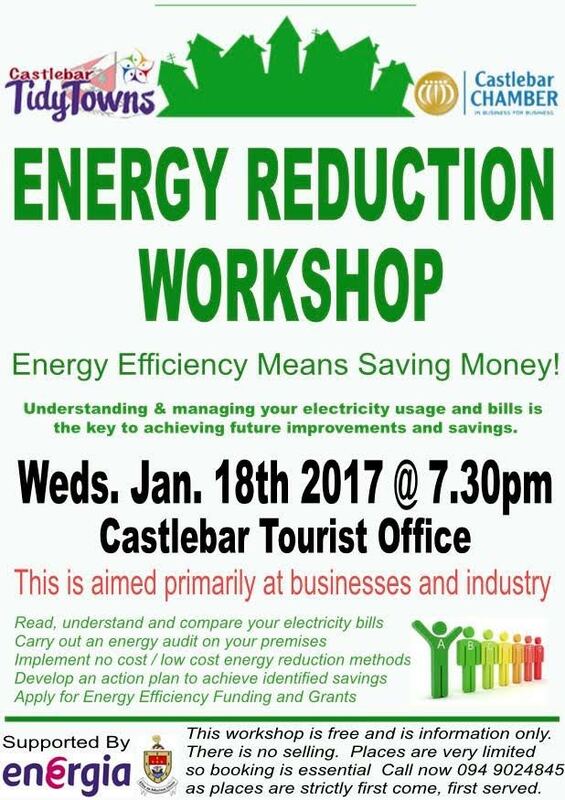 There will be an "Energy Reduction Workshop" held at the Tourist Office in Castlebar on Weds. Jan. 18th at 7.30pm and is free to attend. It is aimed primarily at businesses and industries to help reduce their energy bills. This is a workshop and there will strictly be no selling. The trainer is PJ Henry and is an independent, qualified energy consultant engineer originally from Mayo and has worked with Abbott, Wyeth, Braun etc. and currently provides training seminars and energy audits to various companies around Ireland. This workshop is part of an EU/Government requirement on electricity suppliers to promote energy awareness. These workshops have been held across Ireland with huge success with some participants recording a 20% reduction in their bills. This is a very worthwhile event and remember, places are very limited and will be allocated on first come, first service basis so booking is essential on chamber@castlebar.ie or 094 9024845 before 2pm. The event is hosted by Castlebar Tidy Towns and supported by Mayo County Council, Castlebar Chamber of Commerce and Energia.